How fun is this?! 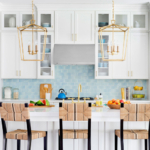 Manhattan-based interior designer Sara Gilbane is known for her traditional style with a modern twist, but she upped the whimsy factor when designing her parents’ home in Palm Beach, Florida! 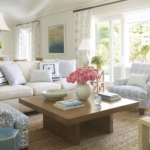 Captured by photographer Paul Costello for House Beautiful, the dreamy waterfront home is filled with breezy blue hues and a comfortable, laid-back vibe I adore! Not only is her use of color impeccable, I love how the designer incorporated plenty of pattern and texture too. 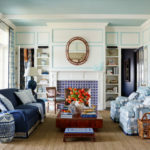 She also considered the family’s New England roots, mixing heirlooms and period pieces with Palm Beach-inspired elements. The dining room is a great example! How fabulous is that hand-painted mural?! You can read the article all about the home, see more photos, and learn sources right over here! And check out Sara Gilbane’s portfolio for even more colorful, inspiring designs! That flamingo mural is to die for, I’ve always been a huge fan of flamingos. What’s not to love — a large, graceful PINK bird! I love the tent-like treatment of the ceiling. Just beautiful!